Gwenda and Ross White farewell the Whittlesea community after 48 years of service. 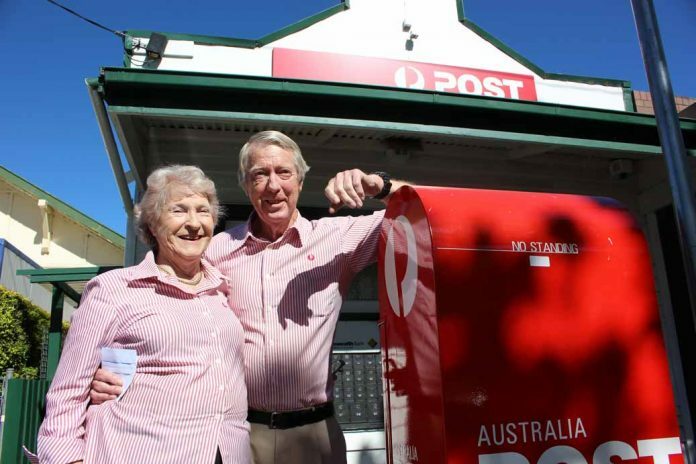 FOR Gwenda and Ross White the relocation of the Whittlesea Post Office signals a new era. After 48 years of dedication and hard work, the husband and wife team will be doing the last mail call next week when new Whittlesea Post Office owners Andrew and Sneh Schie pick up the post bag. For nearly five decades, Gwenda and Ross have ensured that residents were provided with much more than an efficient mail service. Customer service and going the extra mile is important to both Gwenda and Ross but after nearly half a century they have decided to take a well-earned break and have sold the business. It has been a big year for the Whites who celebrated their 50th wedding anniversary in December and their 50th anniversary with Australia Post in January. Reaching their 48th year in Whittlesea, Gwenda and Ross decided it was time to hang up the mailbag and enjoy a well-deserved retirement, travelling and spending time with their three grandchildren. “First of all we would like to go on a cruise, we’ll just start on the small cruise first and see how we travel and then we’ll take it from there,” Gwenda said. Gwenda and Ross took over the Whittlesea Post Office in 1970. They had previously owned the post office in Apsley South Australia where they were for 20 months and then they worked at the mail centre for four months. Ross’ grandmother had heard through an old school friend that the couple in Whittlesea were retiring and through their connection they were able to meet the previous Whittlesea Post Office owners who approved of Gwenda and Ross taking over the business. OVER the years there have been small changes but Gwenda and Ross White have tried to keep the post office as close to the original as they could. Just recently the post office, which is 95 years old, was granted a heritage listing status and is up for sale. Gwenda explained that her and Ross also differentiated their post office by doing everything the traditional way. Gwenda and Ross thanked everyone for their support and said they will miss the people of Whittlesea. “(Our fondest memories) are the people,” they said. “We’ve seen three generations. Just sharing peoples joy and their sorrows… Your customers become family to you, you’ve known them since they were kids, and growing up and having babies themselves. “We’ll miss the people because it’s like part of your family. We watched their children, from babies going off to school. “There have been a lot of memories, a lot of funny memories. Many local residents have said they will dearly miss Gwenda and Ross. Trish Wileman of Hairy Cherubs told the Whittlesea Review that the Whites have been an integral part of the community. “They’re like Whittlesea icons. They’ve watched families grow from young to old – that’s pretty special,” she said. Over the past couple of week’s Gwenda and Ross have been helping the new owners and said they will continue to provide support where needed. Andrew and Sneh Schie thanked Gwenda and Ross for all their support and said they were excited about opening the new post at Shop 1, 66 Church Street, Whittlesea. “We look forward to being able to serve the community and we want to assimilate and become part of the community as a whole. Our ambition is to move up here and become a greater part of the community,” Andrew said.